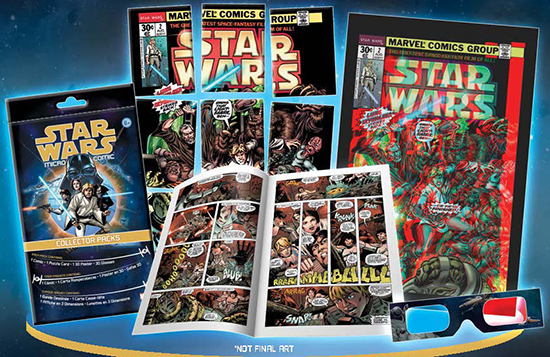 2015 IDW Star Wars Micro Comic Collector Packs brings together the worlds of the original 1977 movie, the Marvel comics that were inspired by them, trading cards and more. Each pack is anchored by one of six comic reprints. These are mini versions of the adaptations did for A New Hope back in nearly 40 years earlier. One card is also included in each pack. These are based on the comics. 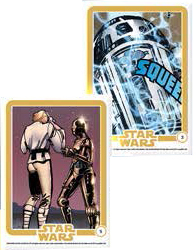 In true modern trading card fashion, they come with foil stamping. Card backs fit together to form a puzzle. With just one per pack and 36 in the set, this is by far the toughest part of the 2015 IDW Star Wars Micro Comic Collector Packs to complete. Rounding out the packs are one of three posters. Not only do they offer another look at the cover art from the early comics, but they do so in old-school red and blue 3-D. In order see the 3-D, you'll need some glasses. Each pack has a pair that has more comic artwork.